Stone Mountain Park offers 10 family-friendly attractions in the theme park area with one ticket through the Adventure Pass. Check out our three MUST DO favorites I discovered from a one day visit to this Georgia treasure. 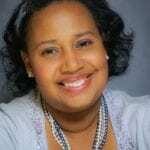 It all happened during a long weekend with two young children and my baby boomer father. You will also get some tips you can transfer to your own trips to a theme park, no matter how long they are. My family recently took a weekend to act as tourists in our own city with a trip to Stone Mountain Park. 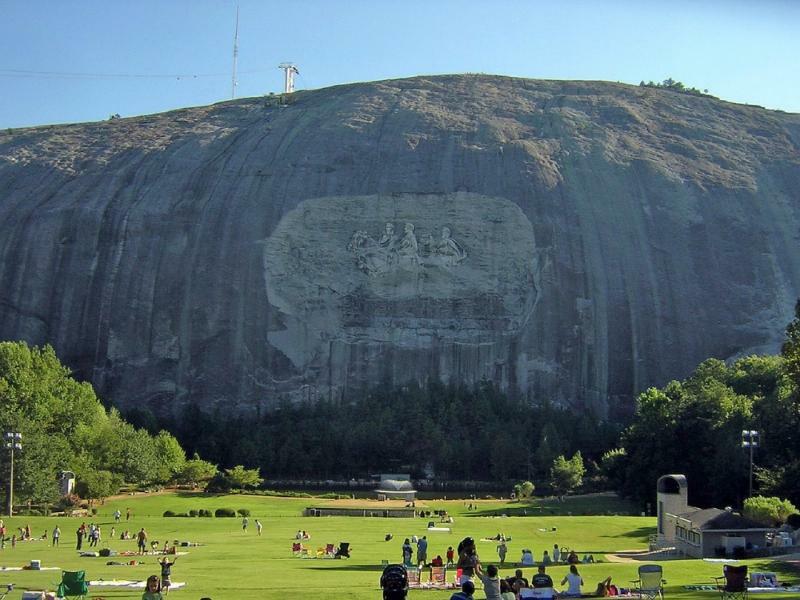 Located just east of Atlanta, Stone Mountain Park is one of Georgia’s most visited parks for both tourists and local visitors alike. Because the park offers areas for walking, hiking and fishing, visitors are just as likely to be locals with annual parking passes as they are to be visitors from out of town. For out of town guests (or families on a staycation), the park has areas for camping (and glamping), fishing, two golf courses, a luxury resort and a family friendly theme park area with rides and attractions. Because of the wide variety of activities a family can enjoy, it’s the perfect place for a long weekend. There are plenty of options for your family to choose from but I want to share my family’s top three MUST Dos. Because my father was visiting and my boys wanted to show him their favorites from our other visits, we headed straight to the attractions area to get checked in and plan our strategy for the day. Mapping out our MUST DO things of the 10 attractions as well as the second-tier things we really wanted to do (but could miss) made sure we maximized our time. One of the benefits for visiting often is that the attractions vary by season. There are 10 attractions open for the spring – fall and special seasonal themed activities and entertainment. During the winter, there are six attractions and holiday themed activities; they even make SNOW in the South at Snow Mountain. TravelingMom Tip: Unlike other theme parks, the attraction area isn’t fenced in so your family will be eager to get started right away. They actually can start wandering through the different attractions and preview their day. 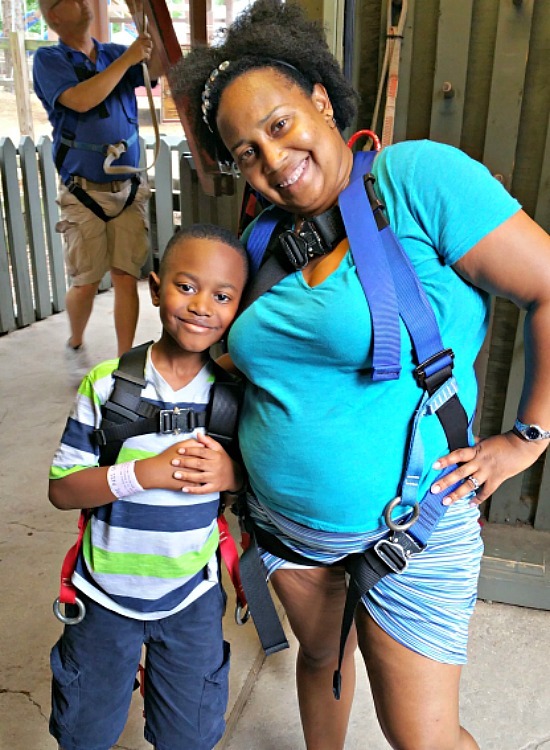 The 8-year-old wanted to head straight for the adventure areas by visiting the SkyHike adventure course. The SkyHike offers climbing at three levels over a quarter of a mile; a 12-foot level, a 24-foot level and a 40-foot level. There is a requirement that everyone has to be over 44 inches tall and less than 200 lbs to take it on so I took advantage of having grandpa visiting and took it on with my oldest son. My father and the youngest stayed on the ground. It is slightly intimidating and once you’re in the harnesses, you’ll feel safe, even if you fall. I’ll admit I did slip on one section of a rope bridge. At the 12-foot level, there are parallel paths with one side offering a more challenging course. We each took one and I switched with him at a few points for the easier course. The key thing is don’t look down and take your time! While we took on the higher course, my father walked the 4-year-old over to the lower level SkyHike. This level is only about 24 inches off the ground but offered my younger son plenty of opportunities to challenge himself just like his big brother. TravelingMom Tip: Don’t be afraid to split up into age-appropriate activities. My father had time to bond one-on-one with my youngest son while I explored with the oldest. The Stone Mountain Railroad was one of my family’s favorite attractions because we can all connect our own experiences to the train. My boys love a good train and the railroad is a full-size train from the 1940s with open air cars. My father thought about his own experiences on riding the train to Disney as a 5-year-old with his grandmother and was able to share that with my boys. As the bridge between them, I loved being able to see how they connected with this common experience. This was an unexpected benefit for multi-generational travel that I found in even just a day-long experience. 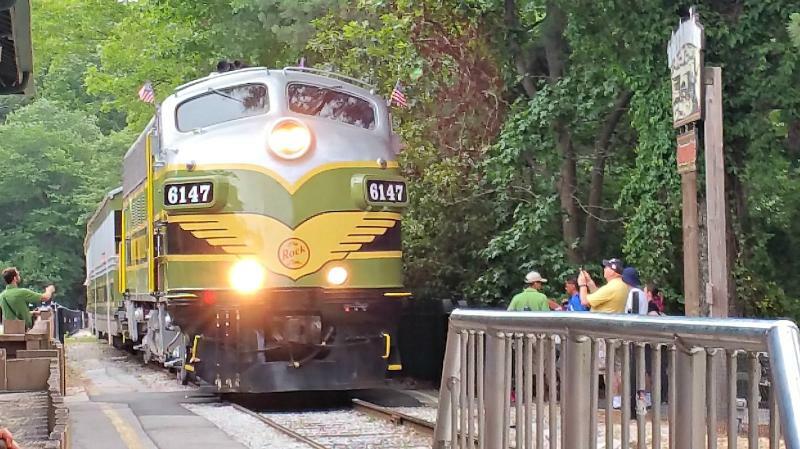 The actual train ride is a five-mile trip around the base of Stone Mountain and lasts about 30 minutes. The train is a smooth ride and allows you to see the different parts of the mountain, including picnic areas, historical/educational areas and walking paths to the top. Beware that there might be a slight “holdup” as you’re riding but you’ll be back on your trip in no-time. TravelingMom Tip: When you’re traveling with multi-generational family members, try to experience at least one thing that everyone can agree on and do it as a group. You’ll never know what memories will come from the experience. Stone Mountain has a walking path to the top but since our day was focused on the attractions, we took the Summit Skyride to the top. The Skyride is a Swiss-style cable car system for two cars; one car must go up as the other comes down. During the ride up/down, the car operator shares different stories about the park and one of its more well-known features, the Confederate Memorial Carving. The ride itself actually doesn’t take very long at all but the real treat is being at the top of Stone Mountain. 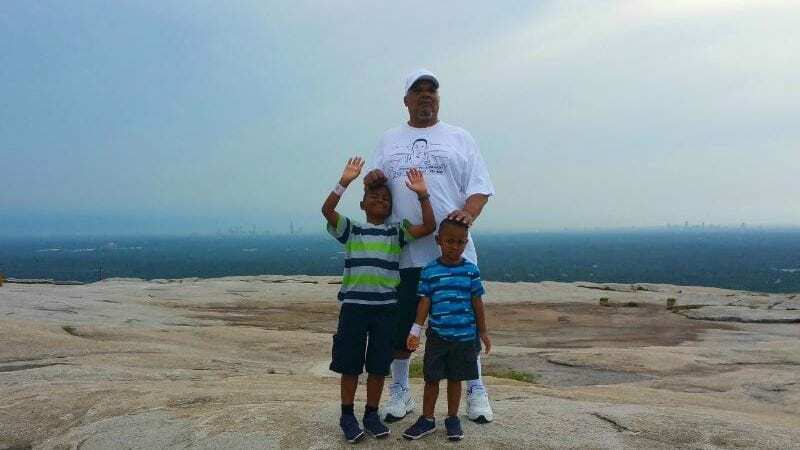 Being at the top of the mountain is my absolute favorite part of visiting Stone Mountain Park and one of my favorite places in the Atlanta area. It wasn’t until I visited that I realized Dr. Martin Luther King references Stone Mountain in his “I Have a Dream” speech. It is a beautiful landmark that truly represents the highest points of Georgia. On a clear day, you can see the Atlanta Skyline, the Appalachian Mountains, Kennesaw Mountain, up to a full 60 miles away. There is always an amazing breeze at the top and my sons love being able to run around. The top is relatively flat and there’s a fence surrounding the top just in case someone gets a little too close to the edge. Taking pictures at the top is perfect because the space is large enough that you’ll rarely be crowded by another family angling for the same background. TravelingMom Tip: Plan more relaxing activities during a naptime for younger children. They won’t fall asleep but it will help them calm down a little so you can extend your family’s day. The natural sounds of the wind are very relaxing. I only shared the top three things that my family loved but I promise there are so many more reasons to make a long weekend of your visit. I didn’t even tell you all about the Lasershow Spectactular that is most certainly worth making a night visit for. One of my fellow traveling moms, Carissa Rogers, shared all the reasons why she thinks it’s worth a visit too. Be sure to get her take on it. 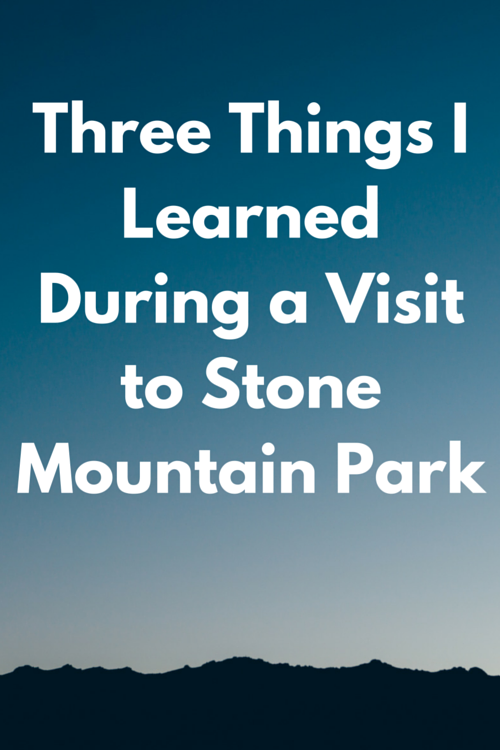 Baby boomer me liked reading about your father’s experiences with the grandkids at Stone Mountain!